DeckLink Quad HDMI Recorder is a high performance PCIe card that lets you capture from 4 different HDMI sources in any combination of SD, HD, Ultra HD, 4K and even computer formats, all at the same time. DeckLink Quad HDMI Recorder is a high performance PCIe card that lets you capture from 4 different HDMI sources in any combination of SD, HD, Ultra HD, 4K and even computer formats, all at the same time. Featuring 4 independent HDMI 2.0b input connections, DeckLink Quad HDMI is like getting 4 separate and customizable capture cards in one, making it perfect for software live switching, real time computer game capture, streaming and more. HDMI Audio Inputs: 8 Channels embedded in SD/HD/UHD/4K. 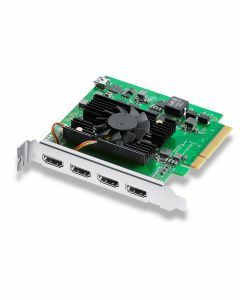 Computer Interface: PCI Express 8 lane generation 3, compatible with 8 and 16 lane PCI Express slots. Software Included: Media Express, Disk Speed Test, Blackmagic Desktop Video Utility and Blackmagic driver on Mac OS and Windows. Media Express, Blackmagic Desktop Video Utility and Blackmagic driver on Linux. Physical Installation: PCI Express 8 lane generation 3, compatible with 8, 16 lane PCI Express slots on Mac OS, Windows and Linux. Please check the Support pages to see the full system requirements. Other supported applications include: Cinegy Capture Pro, DevTek EasyMediaSuite, Glookast Capturer, Livestream Producer, Metus Ingest, Softron MovieRecorder, Tools On Air Just: In. HDMI Color Precision: 8, 10, 12-bit RGB 4:4:4 in all modes up to 4Kp30 DCI and 8, 10-bit YUV 4:2:2 and 4:2:0 in all modes. 8‑bit RGB 4:4:4 in all DVI modes. HDMI Configuration: HDMI 2.0b supports Deep Color and HDR. Automatically configures to connected display. Multiple Rate Support: HDMI inputs are switchable between SD, HD, Ultra HD, 4K DCI and DVI modes.